Q the flanders chandelier appears to be light beige colour on most websites. I have seen it on the Horchow website and it appears to be a white/grey colour. The colour is belgian white so wanting to know if it is available in only the light beige? 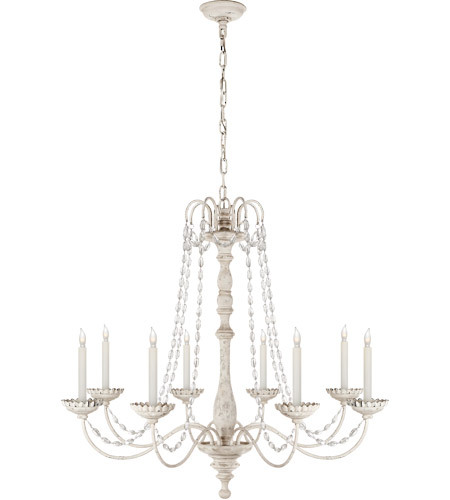 A The Visual Comfort Chart House Flanders Chandelier CHC1548BW-SG is only available in the belgium white finish. Q This chandelier looks completely different on various websites. It looks darker gray and iron color on other sites and very white on some. Is it really as light as this picture? A The Visual Comfort E.F. Chapman Flanders 8 Light Chandelier CHC1548BW-SG has a belgian white finish, which will be an antique white. Q is there a matching sconce to this chandelier? A Unfortunately, the Visual Comfort E.F. Chapman Flanders 8 Light Chandelier CHC1548BW-SG does not have a matching sconce.